Nestled into the foothills of the Blue Ridge Mountains, Greenville SC homes for sale have a lot to offer residents. 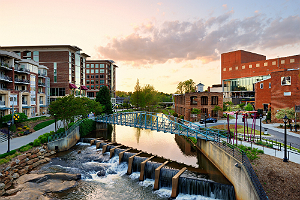 With the city’s strong focus on revitalization of its downtown core, Greenville has blossomed into an attractive area for homebuyers with many vibrant communities throughout. Homes in Greenville are close to an array of world-class museums, galleries and theaters. They have one-of-a-kind attractions like the Liberty Bridge, unique boutiques and delicious restaurants. Surrounding Greenville, SC, real estate you’ll find an unparalleled blend of history and Southern charm. There are vibrant retail and business districts as well as shopping and dining opportunities around every corner. Read more about Greenville real estate or browse through some of our featured Greenville listings below. 818 Properties Found. Page 1 of 103. Register with us to save your searches, unlock advanced search tools and to be notified when homes that meet your criteria become available. From affordable, humble and modest homes to beautiful estates, Greenville real estate has a home for every budget. Historical homes, colonial characteristics and contemporary buildings are only some of the home styles that Greenville has to offer and they all have tremendous amounts of character. Additionally, the condos for sale in downtown Greenville range from beautiful midrise buildings to urban and cutting edge lofts. And the interiors are stunning to boot! Downtown Greenville homes for sale are in the heart of Greenville. Learn more about this historic neighborhood today. North Main homes for sale have been well-maintained and updated, while maintaining their historic charm that makes them so appealing. Learn more about North Main real estate! Augusta Road is less than a mile from Downtown Greenville SC and is known for having some of the finest boutiques in the Upstate. Learn more about Augusta Road homes for sale. The picturesque neighborhood on Earle Street in Greenville SC has many single-family split level homes. Earle Street homes for sale have rich exteriors and are situated on beautiful tree lined streets. Learn about Earle Street Homes for sale today! Have a question about Greenville SC real estate? Contact us and we’ll be happy to help you with anything you want to know.